What Type of Acid Is in a Pineapple? The best pineapple varieties ripen fruit with a perfect balance of acid and sugar. If a pineapple contains too much acid, the fruit quality falls. The acid-to-sugar ratio of the fruit helps determine whether a specific cultivar produces fruit for canning or for fresh use. Acid content varies with the climate and the season of the year. Flavor changes as harvested fruit ages, but sugar levels remain the same as when cut from the plant. Citric acid makes up as much as 8 percent of some fresh pineapples, according to Drugs.com. Citric acid gives pineapples and citrus fruits their sourness, a flavor component so important that soft drink manufacturers add citric acid to many popular beverages. Chefs use crystalline citric acid or sour salt to add tartness to food. On a cellular level, citric acid allows the conversion of glucose to energy. Some individuals react allergically to citric acid, developing hives, a skin rash and breathing problems. Ripe pineapples also contain high levels of malic acid, responsible for sourness in unripe fruit. A 3/4-inch-thick slice of fresh pineapple 4 2/3 inches in diameter provides 79.3 milligrams of ascorbic acid, or vitamin C. Women 19 years old or over need only 75 milligrams per day, but men require 90 milligrams of vitamin C daily. Ascorbic acid protects your tissues from oxidation damage by free radicals. Oxidation damage could trigger mutations leading to cancerous growths. Eating pineapple and other fruits and vegetables rich in ascorbic acid every day ensures that your body produces collagen proteins. Collagen repairs connective tissue such as skin and tendon. Shortages of ascorbic acid prevent collagen renewal, causing scurvy. Pantothenic acid is a B vitamin found in pineapple, as well as many other foods. It has a long list of uses and benefits for the body, according to the National Institutes of Health, including treatment of asthma, ADHD, yeast infections, heart failure, celiac disease, nerve pain, skin disorders and wound healing. A 1-cup serving of pineapple chunks yields 0.351 milligrams of pantothenic acid. Since shortages rarely manifest there is no minimum requirement, but the adequate intake, as set by the Institute of Medicine, is 5 milligrams per day for men and women. Cultivation techniques help control the acid balance in pineapples, but you'll find the sweetest fresh pineapples only in the summer. 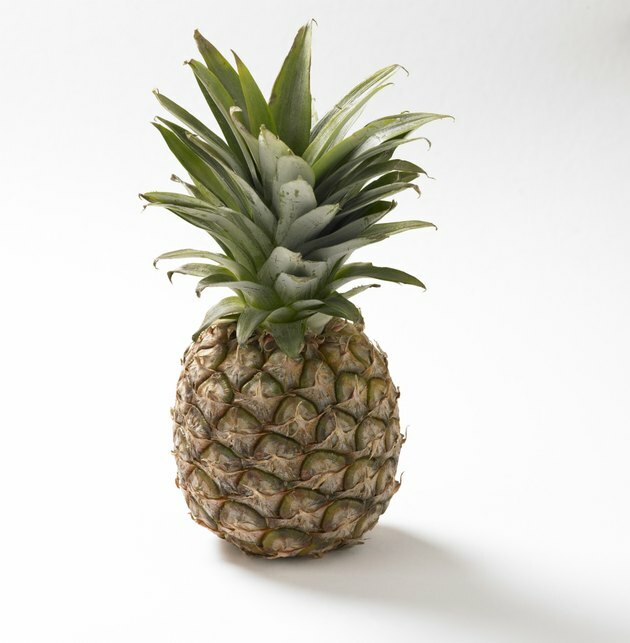 Pineapples fruiting in the winter contain more acid and less sugar. Pineapples grow only in warm climates, within a temperature range of 65 to 95 degrees Fahrenheit. Slightly colder night-time temperatures might not harm the plants, but in colder weather, pineapples grow more slowly and become acidic. Hotter temperatures cause pineapples to produce more sugar. In mountainous countries such as Kenya or Ecuador, the altitude of a pineapple plantation determines the acid-to-sugar ratio of the crop. Gale Encyclopedia of Alternative Medicine; Judith Turner, et al.